I know what your going to think before i even ask the question...... So here it goes. I just purchased a flat fish of some sort in which i have never seen before and i know little about it (no information for this particular fish). I know its related to the flounder, but it does not have the exact shape or mouth. The fish is currently about 2.5". 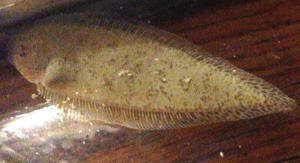 The mouth is very small next to the eyes and is not on the edge of the body like a flounder (the mouth is smaller than its gill plate). I took a shot on this animal because its unusual and it has such a small mouth i do not think it will be a threat to anything anytime soon. Enclosed is the picture. If you are familiar with this fish, please let me know. Based on its size and mouth proportionate to its body, i think it will be no bigger than 4-5" fully grown. Thank you!